This past weekend was a busy one for us. Well, not the entire weekend, Saturday. Saturday was a busy day. I've been trying hard not to over schedule us these weekends; to make sure we have at least one down-day because if we don't we all seem to get a little overwhelmed and cranky. And by "we all" I mean, mostly me. Saturday morning started with Breakfast with the Easter Bunny and an egg hunt at church. We got there a little later than we have in the past so we didn't have time to do any of the crafts, but the boys got their pictures with Mr. E. Bunny and we all had pancakes and sausage for breakfast. I'm looking forward to seeing that picture...Nolan, hahaha, Nolan HATED the Easter Bunny. After the egg hunt we ran home to get into play clothes and then headed east to visit our friends, Kelly & Neil, at Drewry Farms in Plymouth (Ohhhh! Kelly, I'm so excited to see I can order online!!) because guess what time it is?? Maple syrup time!! Oh, you can't see any of the pictures?? That's because my camera died the second I turned it on at Breakfast with the Easter Bunny! Grrrrr. 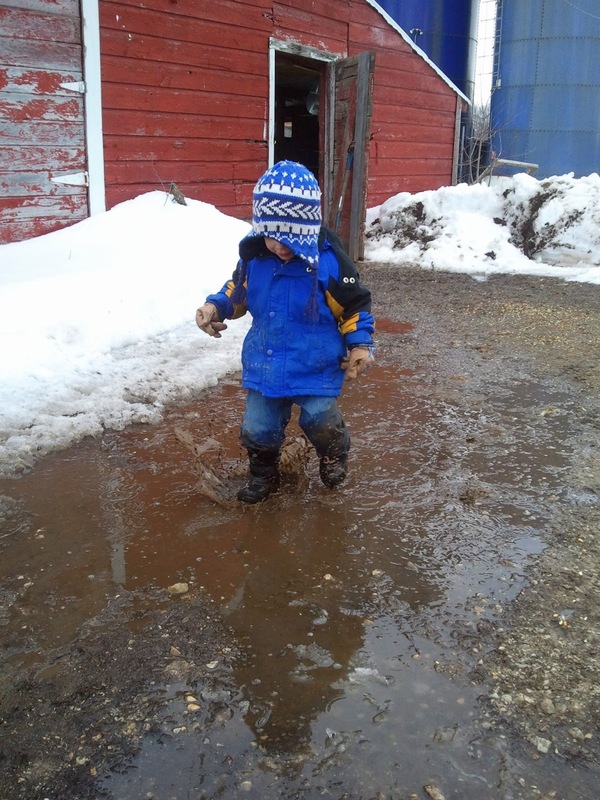 I do, however, have this gem of Hutton playing in the mud puddle at the maple farm. 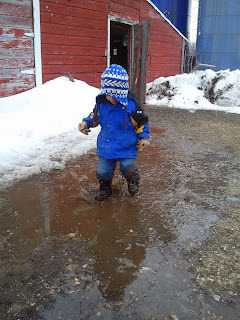 I took this one especially for Uncle Josh, who was waiting to see the mud puddle splashing. (In addition to Kelly & Neil & Little C we also got to see April & Josh & Baby C! - Best Day indeed!) The boys were soaked from the waist down, but they had fun. A new batch of maple syrup meant one thing - new recipes to try. I found this one for Maple Mousse in our Organic Gardening magazine - the instant I saw it I tore the page out; I knew what would be for dessert Sunday night. I've been trying a lot of new recipes lately and a lot of them have been really good. With all these new recipes Collin is forming the "Perfect Meal" - we've only got a few things in our "Perfect Meal" so far, but this, this maple mousse? It made the list. Maple Mousse is officially the dessert portion of our Perfect Meal. It's rich, you only need a little (I made these in little kids glasses), but it is Oh. So. Good. That guessing game was so much fun for me - I believe the winners changed 3 times throughout the guesses. I'm looking forward to the next one, which would be.....what would it be? 4th of July?? Oh man, too long until another holiday. I've decided to take tomorrow off to spend with the boys so for the next two days we're going to do a little Spring Breaking. Hope you are all having a good week! Sweet! :) I love winning. Haha. I think you and the boys should swing over and come visit us here at the bank today.